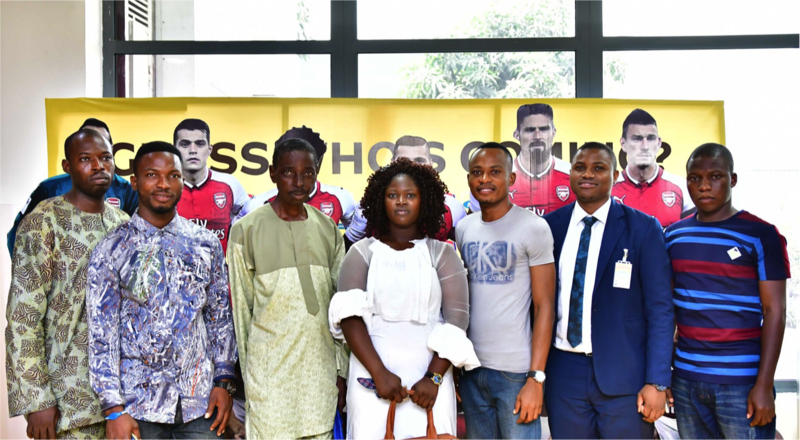 Those were the exact words of an excited Oluwatoyin Famoofo, one of 11 MTN subscribers who attended an exclusive interactive session with three first team players of Arsenal Football Club - another first by MTN, Nigeria’s largest ICT company. The MTN/Arsenal Q&A Session, which held at the MTN Headquarters, Golden Plaza, Ikoyi, Lagos on Wednesday, 31st January, 2018, featured a live video conference where 11 excited fans interacted directly with Arsenal players - team captain, Laurent Koscielny; attacking forward, Danny Welbeck and defender, Shkodran Mustafi and got to ask them whatever questions they chose. These 11 fans emerged from a draw, which held on Friday, 26th January, 2018 in Lagos. They were picked from the numerous Arsenal fans who subscribe weekly to MTN’s service providing exclusive daily content on Arsenal FC (including match day highlights & interviews, press conferences, as well as classic banners of both Arsenal legends and present day players). “Gunners’ fans like Oluwatoyin are passionate about football, the players and Arsenal in particular. A football club with a history of supporting Nigerian talent such as ‘Papilo’, Kanu Nwankwo and Alex Iwobi, Arsenal rightly has millions of fans in Nigeria. “These fans are eager to be heard in matters affecting their club. So being in a position to create this opportunity is something we consider a privilege. Going the extra mile to provide unique and enjoyable experiences such as this for our customers gives us great joy.” said the General Manager, Brands and Communication of MTN, Richard Iweanoge while commenting on the event. Over the years, MTN has demonstrated a commitment to supporting the passions and aspirations of our countrymen. This commitment has birthed initiatives like the MTN Football Scholar and this Partnership with Arsenal. The eleven fans who participated in the Q&A session include Ibrahim Okesanya, Toyin Famoofo, Philomena Adegbuyi, Opeyemi Adebayo, Johnson Agiri, Sunday Macihim, Philip Atunbi, Adewale Bammeke, Mutairu Ahmed, Ayodele Olatunji & Oluwaseun Kosoko. For a chance to win future Arsenal prizes and receive exclusive daily content, text ARS to 700. The service costs N50 per week.